Baboon Skulls Hand Picked Pricing - Atlantic Coral Enterprise, Inc.
Real African Baboon skulls for sale, Chacma baboon, Pipio ursinus. The chacma baboon (Papio ursinus), also known as the Cape baboon, is, like all other baboons, from the Old World monkey family. It is one of the largest of all monkeys. The Chacma baboon is found to be indigenous to the savanna woodlands and mountains of South Africa. Males of this species have large canines that are used aggressively for defense. Adult males can weigh up to 75 lbs, however, females are much smaller. Chacma baboons have a life span of about 18 years. All of our baboon skulls are commercial grade and imperfect. They will have imperfections due to the natural aging process and living in the wild--scars, blemishes, rub areas, broken/missing teeth, bug bite marks, etc. All of our real baboon skulls were harvested and cleaned in South Africa and imported into the United States under a Cities permit. 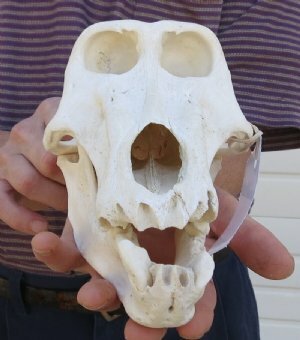 The Cities Permit Number for the baboon skulls is listed with each baboon skull pictured. This is a wholesale website - $100 minimum order required! Each box valued $250 and over will require an adult signature!